eclipse.refreshLocal is Eclipse Platform provided ant task to refresh a specific folder in the workspace. To reproduce the problem, I have written one build.xml file and included eclipse.refreshLocal Ant task to refresh 'src' folder of the dummy project called 'MyProject'. By default, Ant runs in a VM which is different from the VM where Eclipse is already running. As a result, it is not aware of the Eclipse Platform and fails to create that particular task. Run Ant inside the same VM where Eclipse workspace is running. Go to JRE tab. Select Run in the same JRE as the workspace radio button. Click Run button. This time Ant build will be successful. 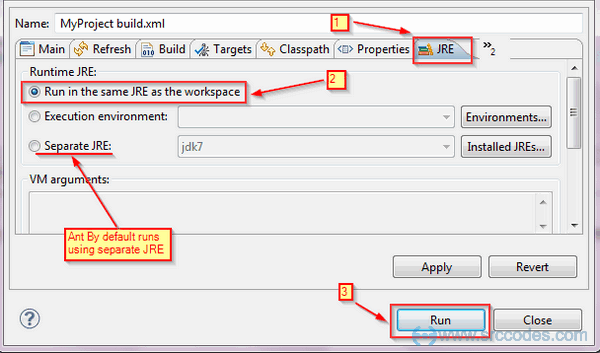 We can configure Ant to Run in the same JRE as the workspace using External Tools Configurations... dialog as well.